As always, it is obvious from the moment you approach Cochabamba in the airplane that it is a different place from what you are used to. The city of over one million is at an altitude of 8,000 or so feet and ringed by mountains. We were there in winter, but the weather was in the 70s every day, though cooler in the evenings. It is called the City of Eternal Spring for good reason! Amistad’s orphanage (called La Villa) is organized into families of 8 to 10 children in individual houses with a mamá. Most of the week, we spent time with the children playing and just hanging out. My Spanish is not very good and most of them speak little, if any, English. However, that really didn’t matter. We played everything from dodgeball to “ice” skating to baseball.I even helped with some English homework where we had to guess at the meaning of some English phrases I had never heard of! The big event of the week was a quinceañera for 10 of the girls from La Villa. A quinceañera is a coming of age event in Latin American countries that celebrates a girl passage into womanhood. I usually describe it as sort of a bat mitzphah or a sweet sixteen party. It was a wonderful evening where we all got dressed up, especially the 10 girls who wore custom dresses, makeup, and fancy hair with tiaras. Everyone from La Villa was there, from the littlest ones on through those in college as well as the staff and their spouses. It was like a family reunion for the extended Amistad family. The evening was a great time to catch up with some people I had not seen in years, renew friendships, and meet new people who shared a common love for the children of La Villa. At one point during the evening I had to make a little speech to the girls. (Fortunately, I had our faithful friend and translator, Sarah, to translate for me.) I talked about Esther 2:7, “The girl was beautiful in form and face.” I quoted the verse and noted that the 10 girls that evening were all very beautiful as well. I then pointed out that Esther was not famous or in the Bible because of her beauty. Instead, it was because of her faith and courage which allowed her to save her people. I encouraged them to rely on their faith and courage rather than their looks. I have no idea what the translated version of that turned out to be, but everyone smiled very nicely! The evening, however, was not just about those 10 beautiful young women. It was about all of the Amistad family who participated; from the little children dressed in their best clothes dozing off in their chairs, to the college students complimenting the quinceañera girls, to the boys trying to sneak into the candy before it was time, to the younger girls obviously thinking about when it will be their turns. And, it was about Alison. 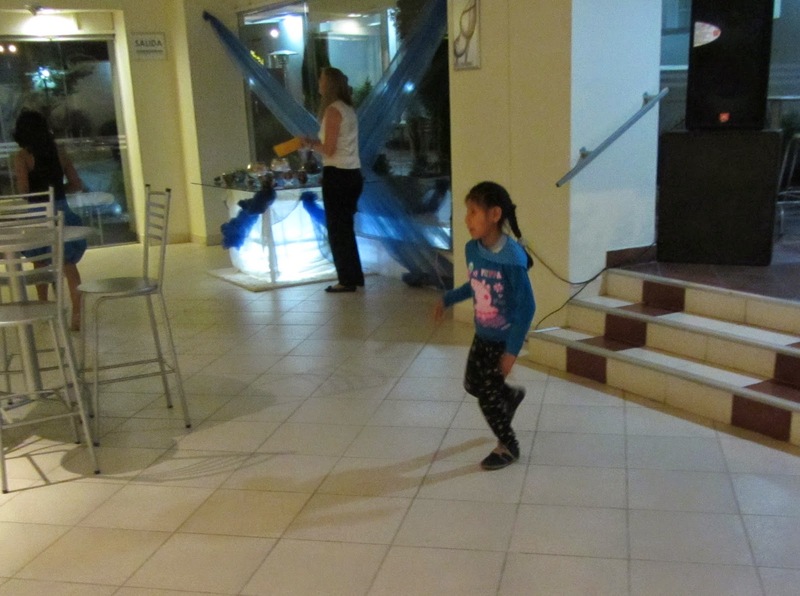 She is a younger girl who when she came to La Villa as a small child was not supposed to be able to walk. Instead, through a combination of miracles and years of loving care, she spent the night dancing. She was in her own world dancing alone to the music. At the same time, she was an integral part of the community, the family that is Amistad. I think that is why I love going to Bolivia. Whatever my failings and limitations, while I'm there, I feel part of the loving, extended Amistad family. Unfortunately, the trip ended with both of us getting sick. So, the transition back to normal life in the States was harder than it usually is. Regardless, the memories will sustain me for quite some time. I’m already trying to figure out when my next trip will be.